GPS gives Rees Construction a better handle on job site grades. As a fifth-generation contractor, Paul Rees has experienced the construction industry firsthand for as long as he can remember. His company, Rees Construction, was established in 1887, and has operated out of Quincy, Illinois, for over 130 years. The company was passed down to Rees by his father, David Rees, leaving Paul as the company’s current president and main shareholder. Paul is a member of the Under 40 in Construction Equipment Class of 2018. “I’ve been around the company my whole life,” Rees says. “I remember when I was little getting in backhoes and things of that nature, and just always being around it. I’ve been working here every summer since I’ve been able to. This is another in a series of profiles highlighting Under 40 Awards winners. Go to ConstructionEquipment.com/U40Appl to enter. Although Rees owns the business, Rees Construction is a family affair. Two of his cousins work as superintendents of Site Development and Excavation, and Sewer and Water. In general, the company specializes in projects relating to excavation, sewer and water installation, site development, and concrete services. In the past 10 years, Rees Construction has more than doubled in revenue, and increased employment and equipment purchases three-fold. Rees also began implementing GPS systems across his equipment fleet in 2016. Rees then expanded into dirt work. “There really wasn’t anybody in town that could take on these big sites, and move all the dirt and put it in the pipe, and do absolutely everything that needed to be done to the site,” he says. “[Since] that tied in with [what] we’re already doing, site utilities, why not start moving the dirt too? Rees says adding GPS machine control was the next step to becoming the best contractor in the overall region. “If you don’t have it, you’re going to fall behind,” he says. “That’s just where the industry’s going. It’s something that I think you have to have. I prefer my competitors not having it to be honest with you. Rees says almost all of the new equipment the company owns is plug-and-play for machine control. With older machine models, Rees says implementing machine control was much more involved. He had to hardwire the machine control technology. Having a better handle on job site grades is among one of the benefits Rees has experienced after implementing GPS machine control. In addition, Rees says it just makes the job easier for the operator. 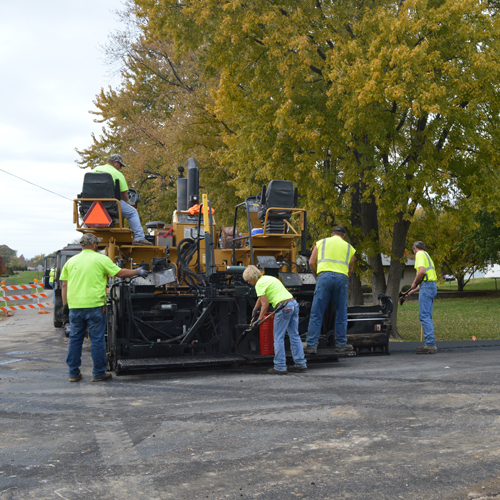 Workers lay asphalt on a local road in Quincy, Illinois. With more machinery on his hands, Rees knew there was also a need for more operators to work for the company as well. Rees says as long as he sees “a need” for new machines, he’s willing to purchase new equipment for his sites. Nearly all of the equipment is John Deere. Rees says the company has worked with Deere for as long as he can remember, so partnering with the company on machine control made sense. Because of advancements in construction technology, Rees has his Deere dealer, Martin Equipment, handle most of his maintenance. Martin also monitors the condition of Rees’ equipment through JD Link, and will typically notify the team before Rees even knows a problem has occurred. “Because most of our equipment is fairly new and we keep our equipment updated, that helps out with the maintenance factor because typically we don’t get into high hours, which means a lot of breakdowns,” Rees says. When it comes to daily maintenance, Rees says his operators go through the equipment each morning, grease it, and check fluids. Between ensuring maintenance is sound and keeping up with technology, Rees admits it’s tough to grow a construction business. He expects to fully own the company by 2020. Becoming a Construction Equipment 40 Under 40 winner is also a “big honor” for Rees. To keep the Rees Construction legacy running strong for another 130 years, Rees hopes his three sons (17, 14, and 10) eventually gain an interest in taking on the business. “They haven’t had a lot of exposure,” he says. “My oldest is at football camps all summer long. So he pretty much can’t work for the summer, and he’s the only one of working age thus far. The youngest one would come over in the summer a little bit and get on stuff. It all depends on them.